First Listen: Tinariwen, 'Tassili' The latest album from the Malian blues-rock ensemble features guest spots from members of Wilco and TV on the Radio. Hear Tassili in its entirety. Tinariwen's new album, Tassili, comes out August 30. 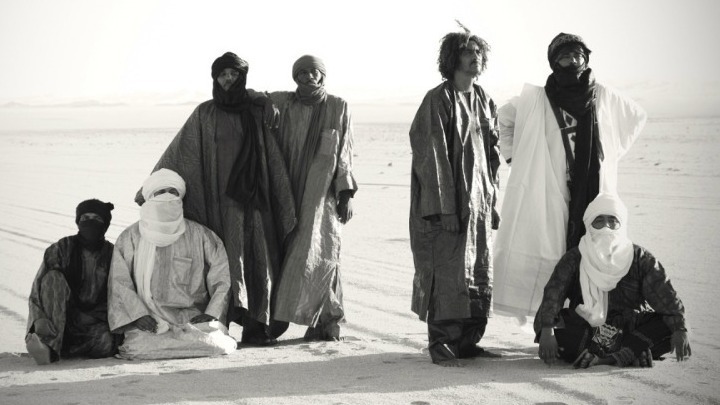 Let's get one thing straight: Tinariwen is just about the best guitar-based rock band of the 21st century. There's a chance you're one of the lucky explorers who has already discovered the magic of the group's music — but if not, stop reading, hit play, and soak in the first song before you read any further. Jimi Hendrix would have loved Tinariwen, and I'm certain Tinariwen loves Hendrix, as well as Television — not the tube, but the New York art-punk band from the '70s. In my mind, there's a direct link: Tinariwen is trance music with attitude. You might not be able to understand what the band is singing about, but it feels familiar, doesn't it? Tinariwen's members are Tuareg people, nomads from Saharan North Africa. Guitarist and founding member Ibrahim Ag Alhabib witnessed atrocities in his youth, including the execution of his father. He tells the story of watching an American Western as a child — the film featured a cowboy playing guitar — and then using a tin can, a stick, and some wire to fashion a guitar of his own. Is there a more rock 'n roll story than that? For those afraid to dip their toes, here are a few incentives: Nels Cline, the brilliant guitarist from Wilco, plays on Tassili, as do Tunde Adebimpe and Kyp Malone from TV on the Radio. Some brilliant brass makes its way onto this record, too, courtesy of New Orleans' legendary Dirty Dozen Brass Band. I've seen Tinariwen play many times in many settings, from small theaters to big festivals, but the group shines brightest in a rock club. The rhythm will get you dancing, the singing will resonate in your chest, and the guitars will carry you away. Listen loud!